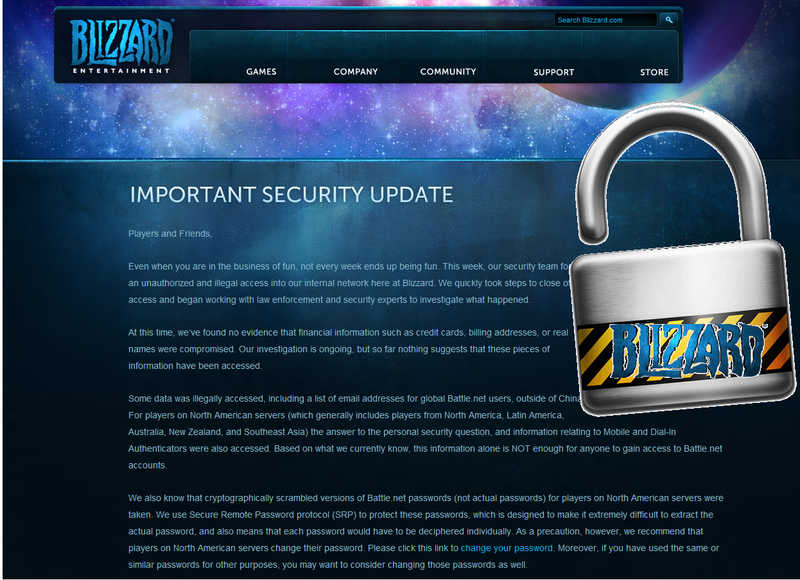 Blizzard has revealed that its Battle.net servers have been compromised, leading to millions of account details being stolen by hackers. The service is employed in all of Blizzard's popular games, including World of Warcraft, Diablo 3 and StarCraft 2. The news is particularly bad considering the upcoming release of an expansion for World of Warcraft, called Mists of Pandaria, set to launch on 25 September. According to Mike Morhaime, president and co-founder of Blizzard Entertainment - the company's servers have suffered unauthorised access that exposed customer information to the attackers. The company learned of the intrusion on 4 August and decided to first investigate the problem and close the security holes before making the incident public. The data accessed by cyber-criminals includes email addresses, security question answers for players on North American servers, and information relating to authenticators, including the mobile authenticator app. More worryingly for North American players is that cryptographically scrambled passwords were also taken, though they may be extremely difficult to unscramble, which at least shows that Blizzard is responsible with password data. Only those outside of China are affected by the hack. Blizzard believes that this data alone is not enough to gain access to an account, but it is still urging players to change their passwords. It suggested changing passwords elsewhere if the passwords are the same or similar, though that is always a major faux pas in net security. The company also emphasised that it never looks for passwords in emails, warning of the potential of phishing scams. Blizzard will be forcing players to change their security questions and update their authenticator software in the coming days. Traditionally an authenticator is considered one of the best ways to ensure account security, but not if Blizzard's own servers have been compromised. "At this time, we’ve found no evidence that financial information such as credit cards, billing addresses, or real names were compromised. Our investigation is ongoing, but so far nothing suggests that these pieces of information have been accessed," -said Mr. Morhaime. For more information about the break-in, including the actions that Blizzard has already taken to resolve problems caused by it, is available in an FAQ on the Battle.net support site. Earlier in 2011 we have seen several other gaming sites became victim of cyber attacks, among them there are Square Enix, Eidos, MapleStory & so on. In the last few months there have been a slew of attacks against the following sites: Yahoo, LinkedIn,eHarmony, Android Forums, Formspring, Gamigo, and Nvidia. We advice to all the users who are registered with Gamigo and have used the same password at other web sites should immediately change their login credentials. Enjoy reading Voice of Greyhat, stay safe and happy on the Internet.